As a stamp collector, you want the stamps in your collection to have the best possible appearance, regardless of value. Bear in mind that your collection is a work of art created by you on the basis of the care you have taken in preparing and selecting the stamps to be inserted into your album. In addition, you do not want to damage your more valuable stamps, which you have searched for over many hours or any stamp regardless of value. We have prepared a step-by-step guide for you, as an assist in learning the best ways to prepare stamps for your collection. Selecting Stamps on envelopes: You are looking at a pile of envelopes with stamps and stamps on paper. Here is how you can turn them into collectible stamps for your album. 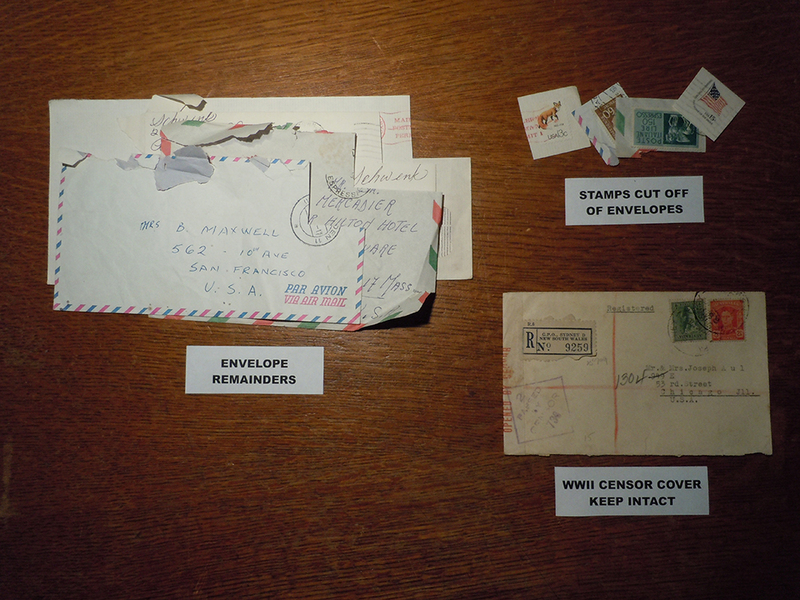 Step 1 – Inspect the stamps for damage. Discard those stamps that are torn or missing part of the stamp, stamps with missing perforations, very heavily canceled (obliterating the design) and stamps with scuffed face and missing ink. You want fault free, good looking stamps to keep your collection looking beautiful. The exception to this are rare and valuable stamps that you may never find again. Having a rare stamp in damaged condition is sometimes better than never having the stamp at all in your collection but don’t let your standards slide – low value stamps will keep reappearing for acquisition and addition to your collection, so don’t keep the bad ones. Step 2 – Before you tear the stamp off of the envelope, don’t forget to check for postal markings that may make it more valuable if left intact. Then, cut or tear off the corner of the envelope containing the stamp, leaving about a quarter inch (3-5mm) of paper visible around the edges of the stamp. Warning – do not try to peel the stamp off of the envelope – you will almost certainly ruin the stamp with a thin or tear. Soaking Stamps off Paper: When soaking stamps off paper there are several factors to keep in mind. 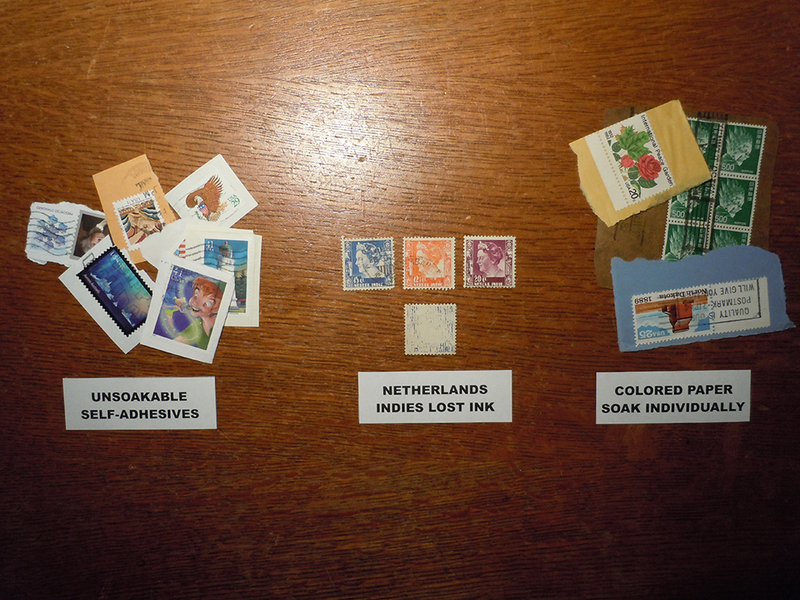 A very few stamps (notably the early issues of the Netherlands Indies) have a water soluble ink. 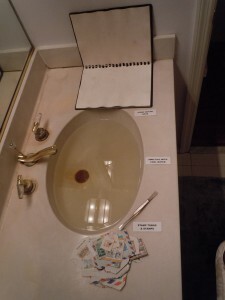 If you try to soak these you may end up with a blank piece of paper. 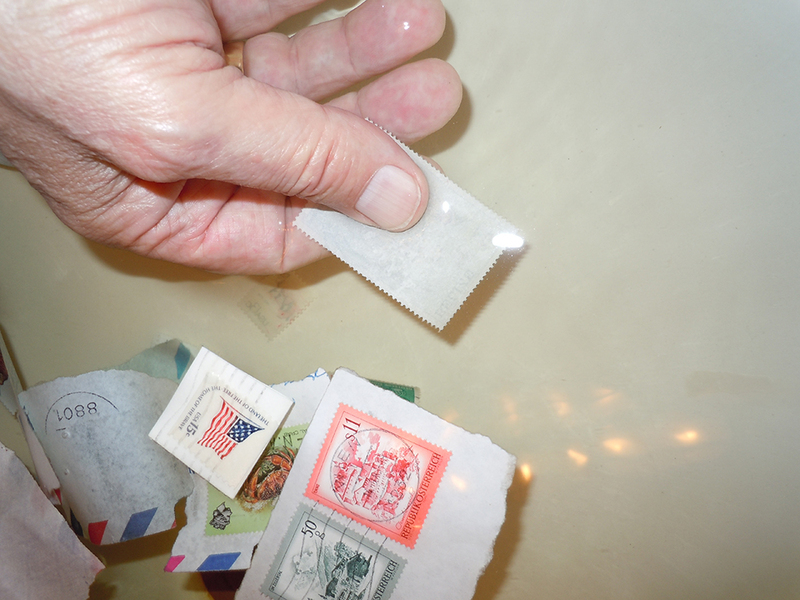 When dealing with modern self adhesive stamps, you will find many that do not soak off paper. These you want to neatly trim up and put in your collection still on paper. Yes – there are several chemicals that will usually remove these stamps from paper without harm, such as benzene and orange spot remover but do this only with great caution, since these tend to be harmful chemicals. 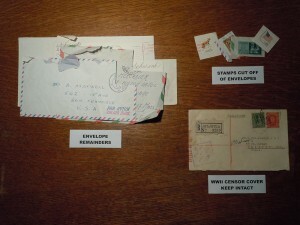 Last, beware of colored envelope paper, particularly red, orange and yellow paper. These colors will often bleed into the stamp and discolor it. Step 1 – Fill a bowl or sink with cool water. The more water you use the faster the stamps will release from the paper, this is a function of the glue dilution into the water. Hot or boiling water may work faster but it is also more likely to damage your stamps. Prepare a nearby drying area with a stamp drying book, blotting paper or a towel. Generally do not use newspaper, since the ink can transfer to your stamps and discolor or damage them. Don’t forget to have your stamp tongs handy. 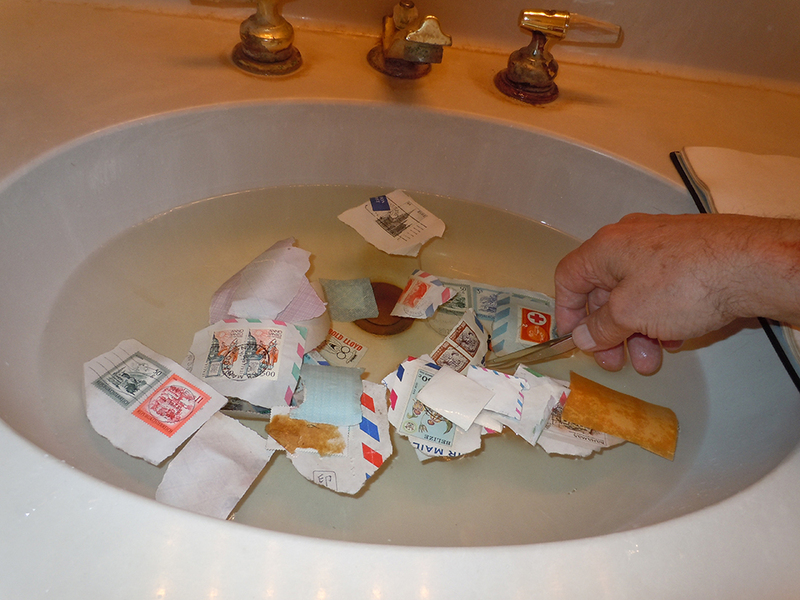 Step 2 – Place a small handful of stamps into the water after separating out the stamps on colored paper for later individual soaking. Be sure that the stamps are not stuck together and swish them around to make sure they are thoroughly moistened on all sides. About one half ounce of stamps per 2 gallons of cool water is a fairly efficient soaking ratio. 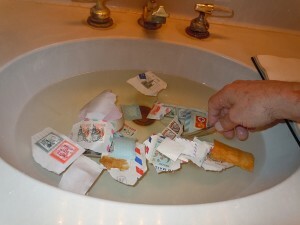 Too many stamps in your water and after a while you have a glue bath that is not good for your stamps. Step 3 – After about ten to fifteen minutes, check some of the stamps to determine if the glue has dissolved enough to safely peel the stamp off the paper. The stamp should peel off easily for safe removal. Caution – at this stage your stamps are water soaked and very fragile, be sure to handle them as gently as possible. You can sometimes slid your stamp tongs between the stamp and the paper to speed up the separation process. 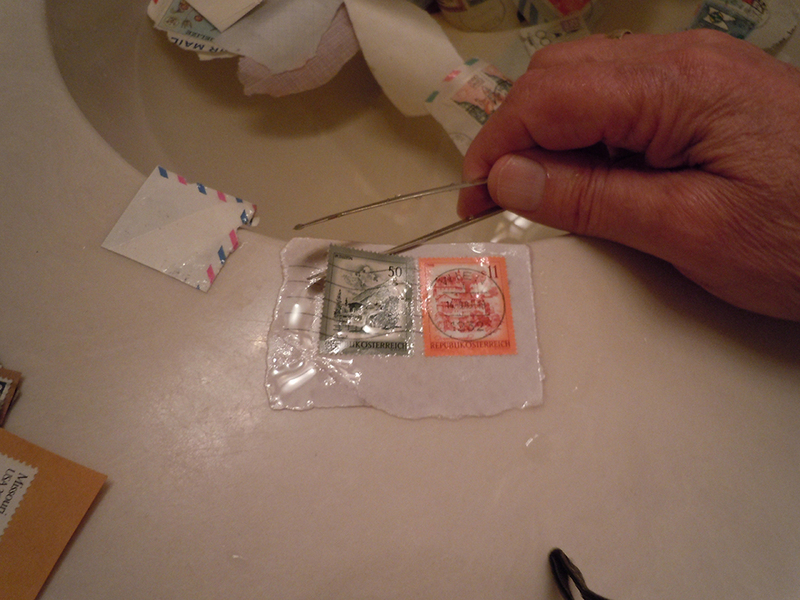 If a stamp does not peel off easily leave it in the water for another ten to fifteen minutes and try again. 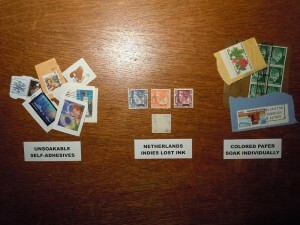 Note that some older stamps have a glue that does not dissolve. In such a case you will have to leave the stamp on the paper, dry it and then trim it neatly. Step 4 – Your final step is to hold the stamp under water and lightly rub the glue side of the stamp to remove any remaining glue residue. If the glue side of the stamp feels slick, it usually means that there is still glue on the stamp. Again though – treat them gently, especially blocks of stamps or stamps with selvage – at this point the paper connecting the stamps will tear quite easily. Now your stamp is ready to be dried. 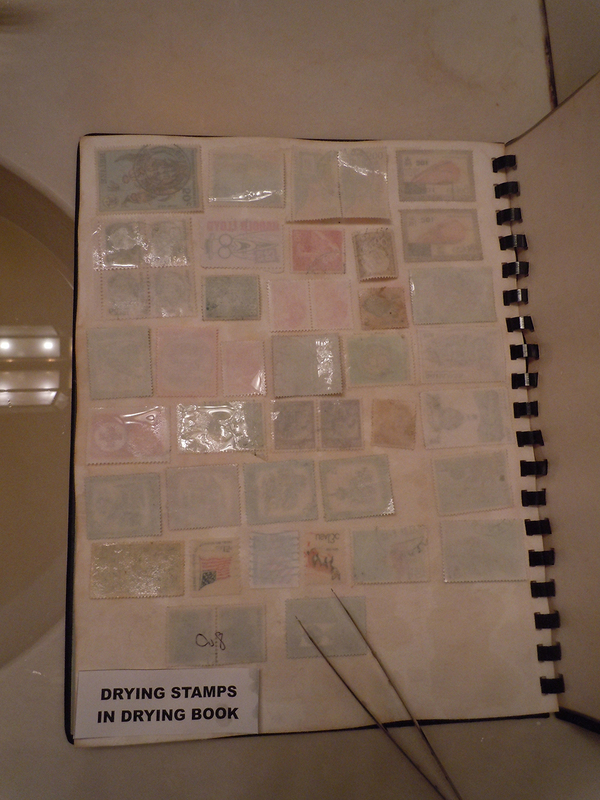 Drying your Stamps: Place your wet stamp face down in the drying book or on the blotting paper or towel. Do not place the stamp face up because if it has any glue residue it will glue itself to the drying surface and you will have to try to soak it off again. Place each stamp on the drying surface without it touching any other stamp. 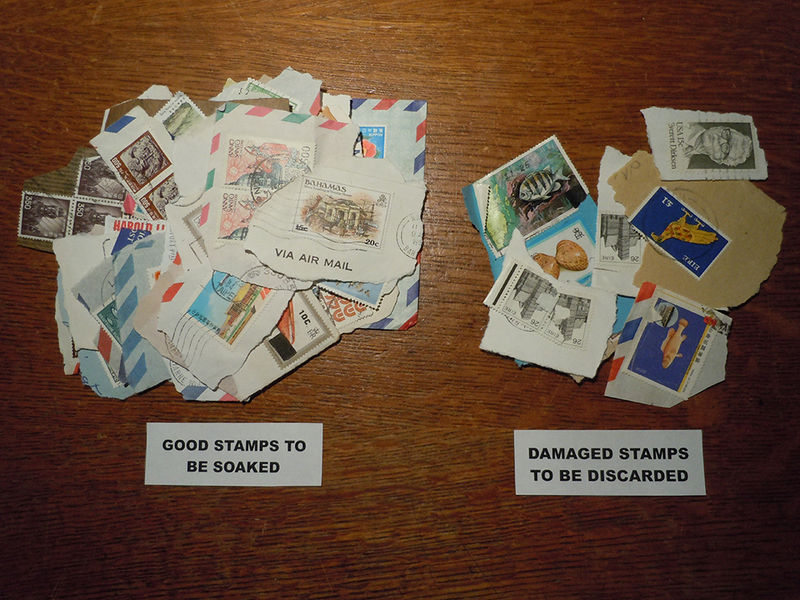 This way the stamps will not stick together and will dry faster. 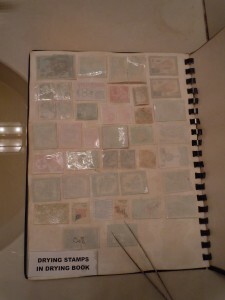 Once you have all your wet stamps on the drying surface, leave them to dry for six to twenty four hours. If your drying surface is on a rack, that allows air to circulate around both the top and bottom, the drying process is much faster. Do not bake your stamps in an oven. You run the risk of over heating them so that they discolor with browning, scorch or burn marks. Also, do not try to cook them in your microwave oven – this creates burn or scorch marks in the stamps, also rendering them damaged and uncollectible. 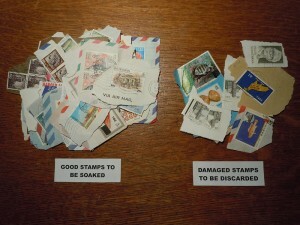 After your stamps have dried, you may have some with curl due to residue gum. This can be easily flattened by pressing in a book or under a heavy weight for a few hours. 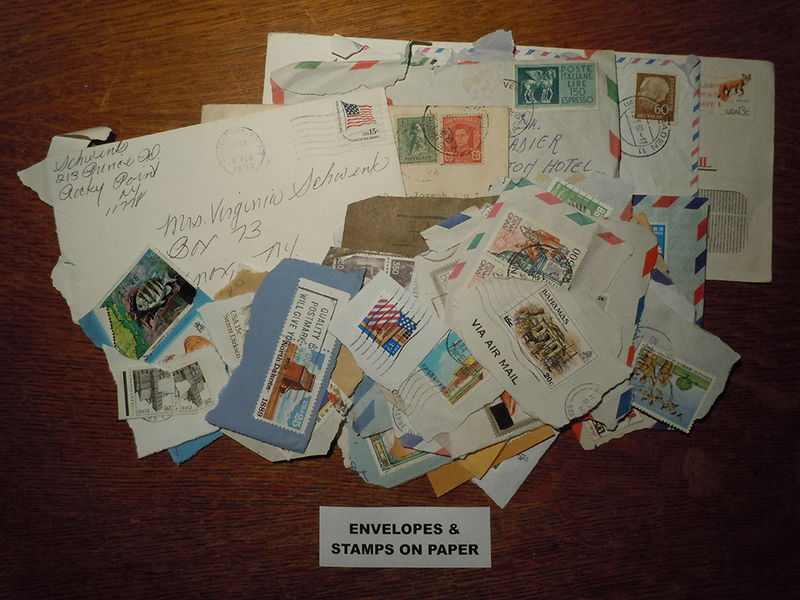 Sorting and Organizing: After the stamps are thoroughly dry and depending on how you collect, whether by country, topic or other area of interest, you are now ready to begin sorting them for your collection. 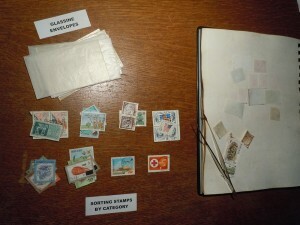 In most cases, some glassine envelopes are a great way to manage the organizing process, whereby you can group stamps from a given country or with a common attribute together and put each such group into a single glassine. 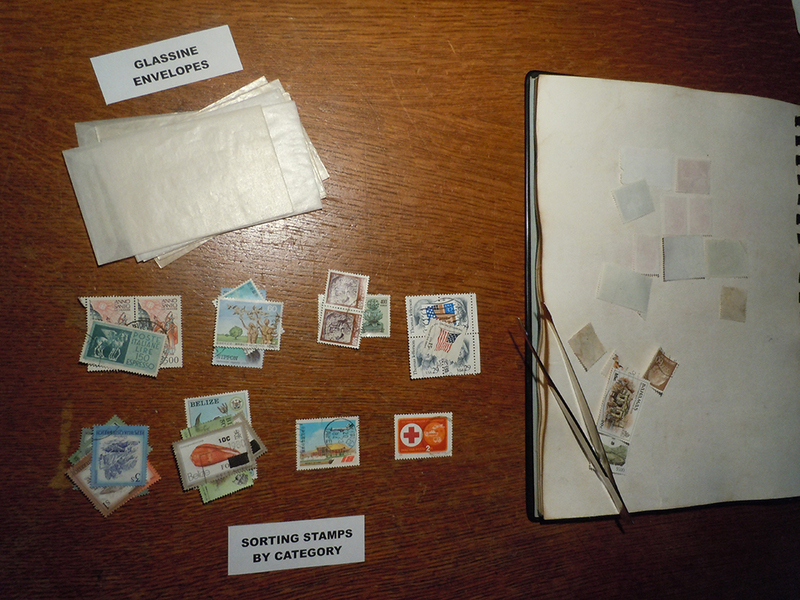 After this preliminary sort you can now begin either cataloging or putting the stamps into your album in the knowledge that the untouched stamps will remain in their glassines awaiting your leisure to process them.